The Expanded Food & Nutrition Education Program reaches limited-resource families through a series of hands-on lessons that are evidence-based and tailored to meet the needs of the audience. Families are recruited or receive referrals and are taught by trained educators and supervised by university- and locally-based staff. 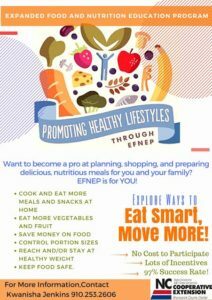 The program strives to see individuals and families experience improvements in diet quality, physical activity, food resource management, food safety, and food security. 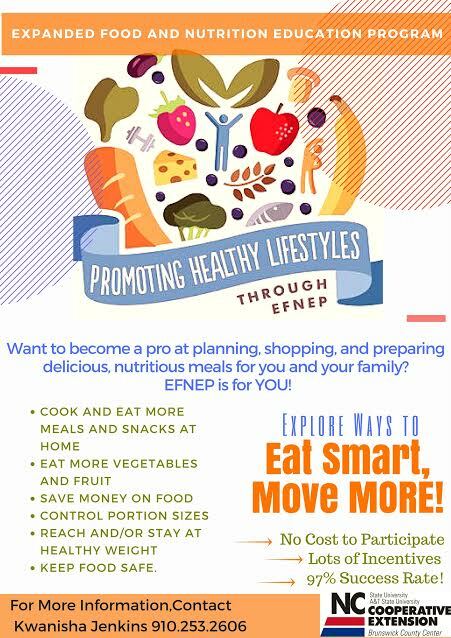 Through classes taught locally participants will learn how to cook and eat more meals at home, eat more fruits & veggies, save more money on food, control portion sizes, reach and/or maintain a healthy weight, and keep food safe. To find out more about this program, contact the Brunswick County Cooperative Extension at 910-253-2610 OR Kwanisha Jenkins at 910-253-2606. Click the flyer below for more info.